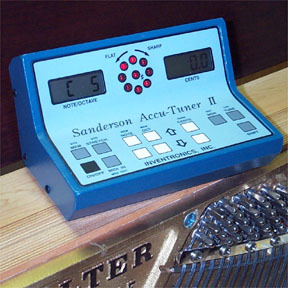 The Sanderson Accu-Tuner II features a sealed long-life keyboard, 60 piano memories, twenty generic tunings (your choice from our extensive list), and built-in MIDI ports. The SAT II comes standard with Battery Charger, Foot Switch, and Operating Manual. It's small enough to fit in your tool box; 7.5" wide, 4" high, and 5" deep and weighs less than 1.5 pounds. The SAT II features two MIDI connectors on the back (one for sending, one for receiving), with a MIDI-IN/MIDI-OUT key on the keyboard. The MIDI port lets the SAT II send the contents of its piano memory over a MIDI cable to a personal computer. Once the tunings are in the computer they can be revised, edited, rearranged, stored on diskette, or printed out. The computer can then send the tunings back into the SAT II over the return MIDI cable. All of the tunings can be transmitted from one SAT II to another via the MIDI cables without the aid of a computer.